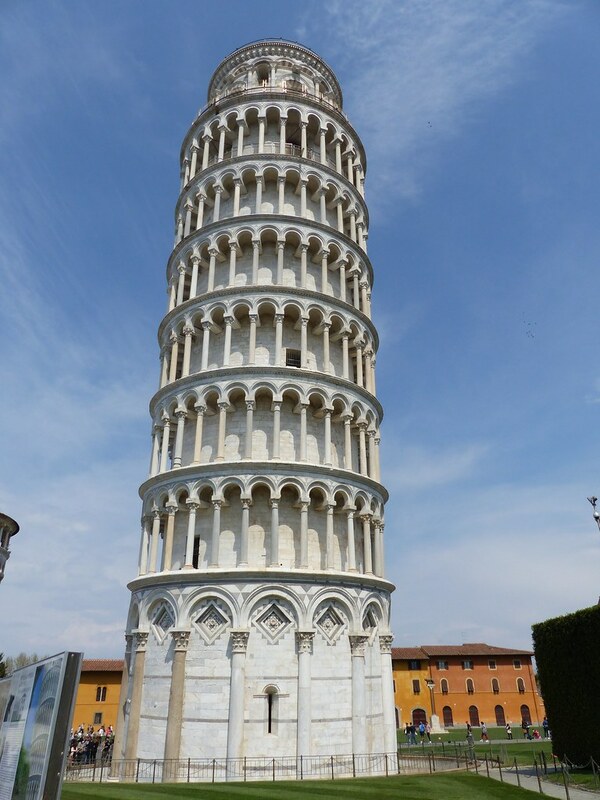 Many tourists visit Pisa for just one thing – the Leaning Tower. Pisa is a shore excursion destination on a cruise or is paired with Lucca and crammed into a day trip from Florence. The tower really is an impressive sight but is only one of four beautiful structures in the stunning Campo dei Miracoli/Field of Miracles. 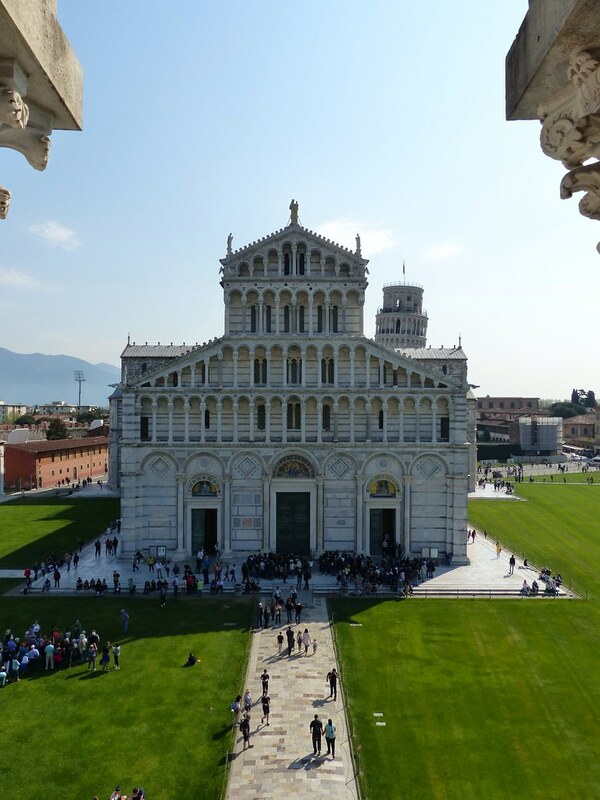 The equally and impressive Duomo, Baptistry and Camposanto are also located on the same site and the city has a lot to offer if you venture away from the main landmarks. Pisa is bustling with tourists but it also has a large student population and is home to a prestigious university. I enjoyed the lively feel of the city which offers a vibrant cafe scene along with plenty of pizza and aperol spritz. Pisa was the perfect location for a trip with some of my oldest friends back at the start of April and was easily accessible from my local regional airport - Bristol. Flights cost around £65 for a return. Pisa is an ideal base for exploring Tuscany with Florence and Lucca close by and easily accessible by rail. We ventured out to explore both locations during our four day trip. Florence was around 7€ each way and Lucca was around 3€, bargain! 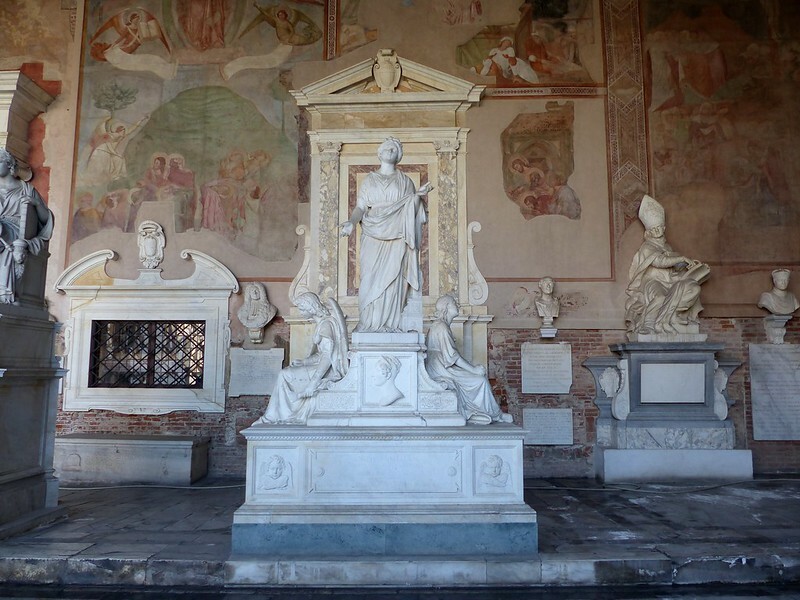 Camposanto Monumentale - Pisa can be crowded with tourists, especially during the high season but a trip to this cemetery lets you change the pace of your trip and enjoy some quiet reflection whilst taking in the beauty of the frescoes and tombs. 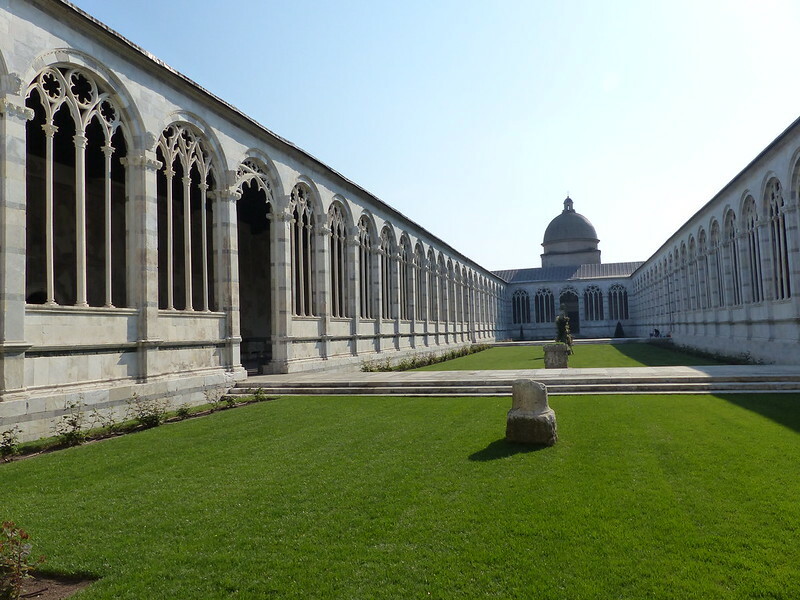 The Camposanto was built in the 12th century but was heavily damaged during WWII. It has been sympathetically rebuilt with 84 tombs still intact and the frescoes are looking bold and vivid after a lengthy restoration process. Pisa Duomo/Cathedral - This is one of the most lavishly decorated churches I have ever visited and is a fine example of a church from the Romanesque period. 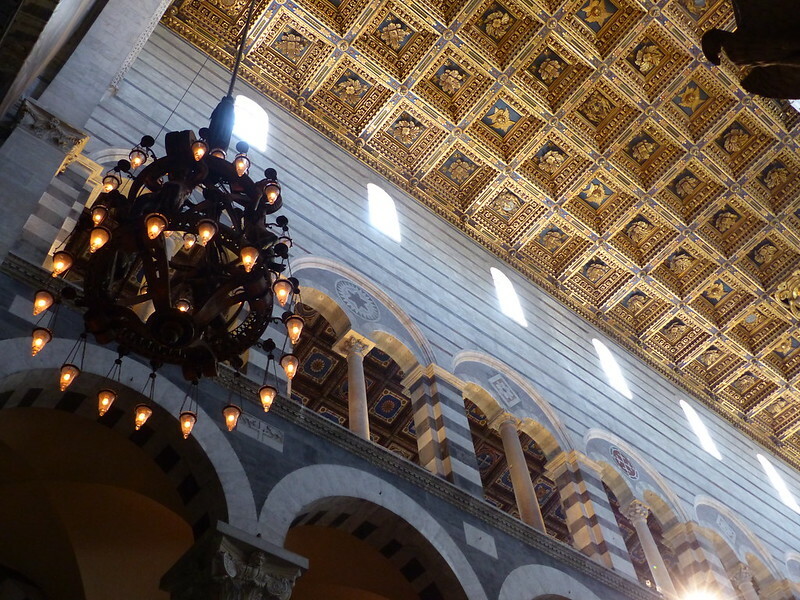 The cathedral was designed by architect Buscheto in 1604 and has some interesting Byzantine and Islamic influenced. 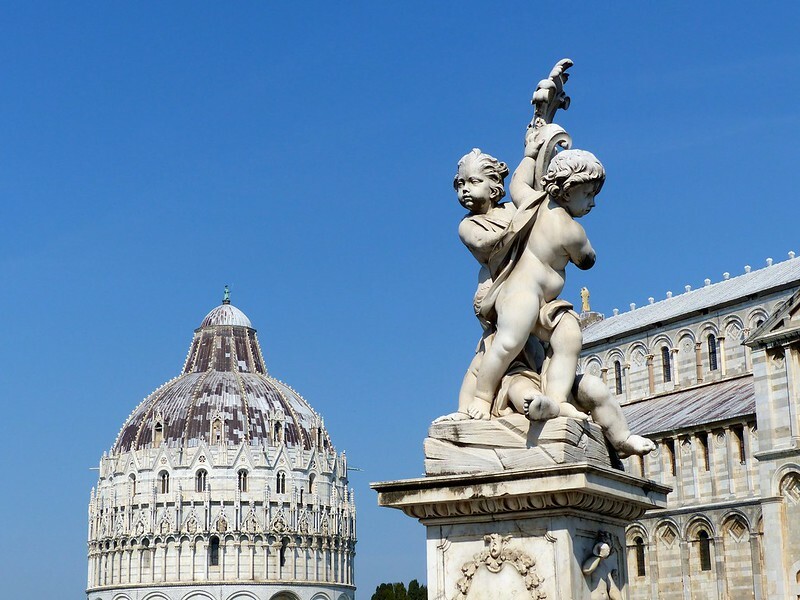 Pisa was once a Maritime Republic and ships would have departed to North Africa and the Middle East and travellers and sailors would have brought these influences back to Pisa. Some noteworthy things to look out for are the mosaic of St. John the Evangelist which dates back to 1302, the pulpit and art by Beccafumi and Andrea del Sarto in the chancel. Baptistry – Also within the same vicinity as the tower and cathedral is the Baptistry. My favourite view of Pisa was from one of the windows at the top of the stairs. You get an amazing outlook of the cathedral with the tower pocking out behind it. I paid 7€ for entry to the Baptistry and Camposanto, this ticket also let me enter the cathedral at any time I liked rather then queuing for a free, fixed time entry ticket to the cathedral. Borgo Stretto - Borgo Stretto is a popular pedestrian zone with shops, restaurants and a market. You can find a plaque at Caffè Settimelli highlighting Galileo Galilei’s birthplace. Ponte Di Mezzo – For a great view of Arno river and buildings looking over it head to Ponte Di Mezzo. You will get the best light early morning or late in the afternoon. Santa Maria della Spina – This small church sits next to the Arno river and has an elaborate gothic facade. It looks really out of place next to the river and is worth a look if your taking photos at the nearby Ponte Di mezzo. Normally I would have lots of recommendations for places to eat and drink but to be honest all the pizza, pasta and wine we had in Pisa was wonderful and much cheaper than you might find in Florence and Venice. You can't really go wrong. My only tips are to eat away from the Leaning Tower as restaurants and cafes near the landmarks add costly cover charges per person. My other tip is to pop into La Bottega del Parco for a coffee (only €1.50!) the owner is an absolute star, so friendly and welcoming. It stood out from the majority of outlets aimed at tourists and has a lovely selection of bread, meat and cheese which you can eat in or have wrapped up to take out on a picnic. I stayed in a small town house which my friend found via Owners Direct. It was a 20 minute walk to the train station and an extra 5 minutes to the tower. The house was ideal for us, located in a quiet neighbourhood away from the crowds of tourists. It was also an absolute steal for about £40 a night between the 6 of us. The owner Virginia was very accommodating and popped in to give us recommendations and check that everything was ok. If you’re thinking of visiting Pisa I urge you to go ahead and book it. It is the perfect place for a two night weekend break or as a base for exploring the rest of Tuscany as part of a longer trip. 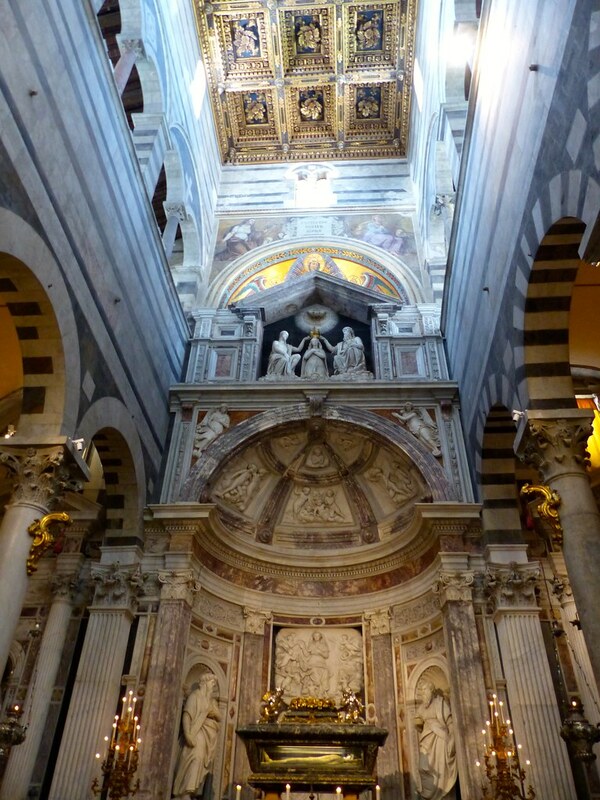 I'll be sharing some of the highlights of my days in Lucca and Florence in separate blog posts. Caio for now! 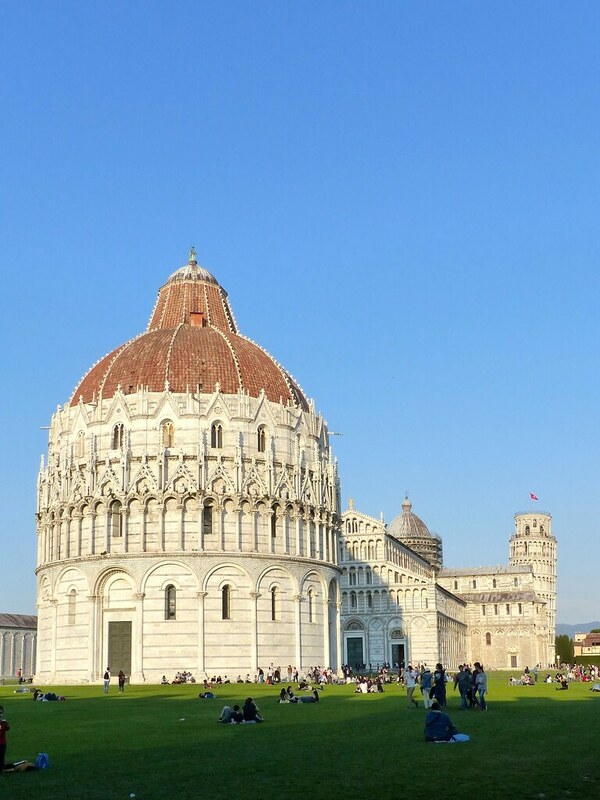 Such an interesting post, there really is so much more to Pisa than that leaning tower. Absolutely loved Pisa when we stayed there four years ago during our honeymoon. I really think the tower isn't even the best part of the place, and the history of how it came to lean is so fascinating! I loved it, just had a relaxed vibe. Not 100 things to see and do but less manic than Florence. It looks lovely. I love Italy but haven't been to Pisa yet - one day! 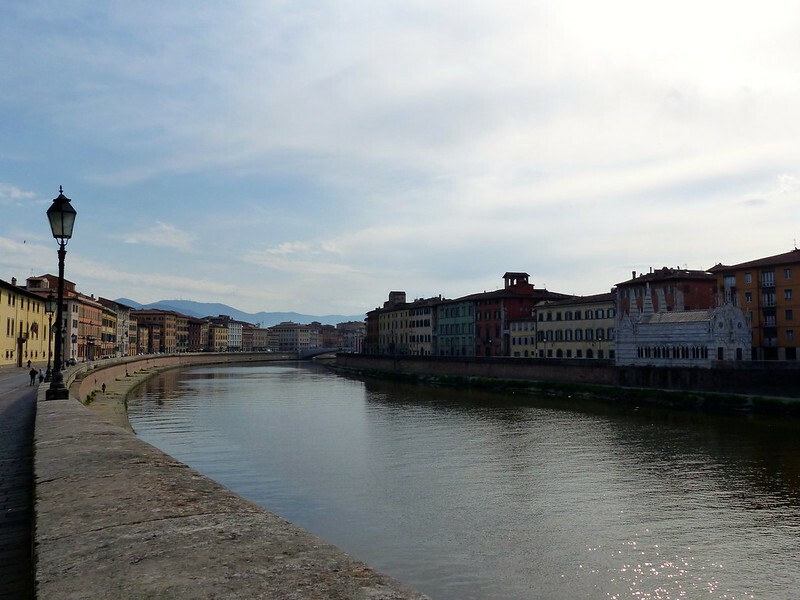 I didn't realise there was so much to do and see in Pisa! We're hopefully going to Italy next year and was only planning on 1 day in Pisa, I might have to change my mind about that and have an overnight stop there. Its a really relaxed place to stay in comparison to Florence, good to go in April if you want nice weather but smaller crowds. What a beautiful place to visit! I had never really heard anything about Pisa aside from the leaning tower! OOOOOHHHH it sounds like there is a world of things to explore once you have done the Leaning Tower. And what a bargain in terms of your flights and also the place you stayed. One to add to my ever-growing "weekends away" list. Your post has actually reminisced my memories of the time when I visited Pisa few years ago on my wedding anniversary. This is such a great post and I love the photos.